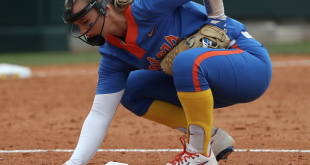 The Florida Gators seemed to be hitting their stride after dropping only one set all Friday against the Dolphins and the Panthers. 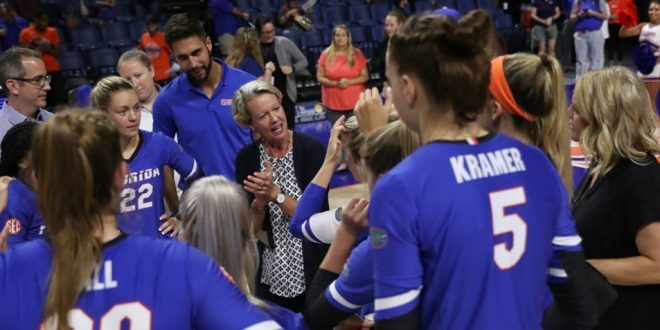 No.11 Florida downed Jacksonville University in a noon match 3-1 and swept Florida International 3-0 at 7 p.m. Friday night during the Honda of Gainesville Gator Invitational. The start was not indicative of the result. Florida dropped the first set against JU as they committed seven attack errors while still hitting at a .212 clip. 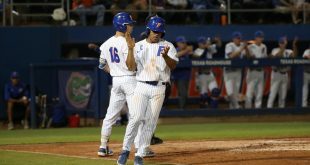 Wise said the early sloppy play might’ve been a result of getting only about a day-and-a-half of rest after winning 3-1 against Florida State in Tallahassee Wednesday night. “In a perfect situation, this team would play the football schedule, one match on Saturday, a week of preparation because we’re so young and learning these new positions,” Wise said. Thayer Hall impressed again. 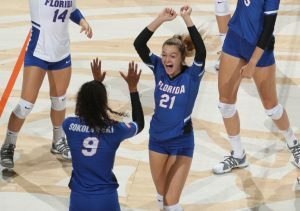 She was a spark plug for the Gators in the second and third sets. Hall assisted the Gators in scoring four straight points up only 11-7 in the second set at the service line, two of those four were aces from her. She improved on that in Set 3. After recording a kill to bring her to the service line again, Florida won 11 consecutive points. Three of those were aces off Hall’s hand. Florida would go on to take the set 25-14. 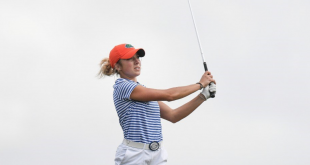 Hall has impressed in just 11 matches played now for the Gators. Hall is the fastest freshman to reach 50 kills in a career and was the first freshman player under Mary Wise to kill 20 balls in a match. Wise credited her physical talent and work ethic for Hall’s success. Florida came out ripping it against FIU Friday night. They hit .458 in Set 1 forcing FIU into a .000 percentage. The Gators even won 10 straight points with Holly Carlton and Paige Hammons at the service line. Florida would hit .421 on the match and forcing a -.101 percentage of Florida International. “As good as our offense was, this was about our defense – starting from our ability to put pressure on them behind the service line,” Wise said. The Gators hit five aces on the match and even went on a 19-0 run with Thayer Hall at the line. Wise said when a team doing that and playing with that level of focus, there really are not many coaching challenges. They took the match in quick fashion. They won 25-13, 25-12 and 25-7 on the night. One impressive hitter on the night was senior MB Taelor Kellum who hit close to .900 on the match. 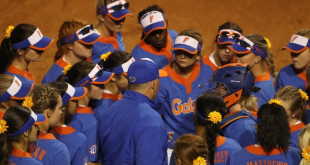 “As a team, we decided we needed to start playing more like the Gators and we committed to the game plan really well and everyone showed up tonight,” she said. Paige Hammons gave credit to how well the team played as a whole. 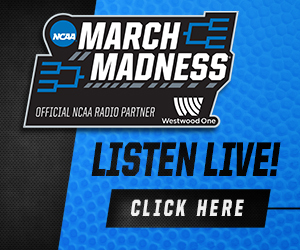 “We did a great job of following the game plan and really all working together. Our passing was on, which means our setting is going to be on and so will our hitting. It was a great team effort all together,” she said. Florida takes on Army at 2 p.m. to close out the weekend.